One of the world's most popular beverages originated in Africa when, legend has it, goats in the highlands of Ethiopia became agitated after consuming coffee berries. Informed of the news, nearby monks began to brew coffee to help them stay alert for prayer. Eventually, news about the wonderful beans spread to Arabia and later, the rest of the world. Coffee drinkers through the years have come up with myriad ways to enjoy the brew. Adding milk and sugar is a popular option. Pour brewed coffee into a cup or mug. The more milk you want to add, the larger the cup should be. Add milk and stir again. Check to see if the coffee is cool enough to drink. Enjoy! Make espresso according to your home machine directions. 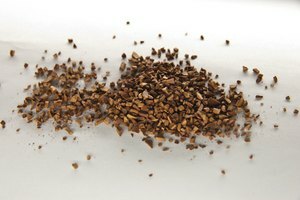 Most home machines require you to scoop roasted, ground beans into the press portion of the machine, add water to the water compartment, and let the espresso brew into a cup. 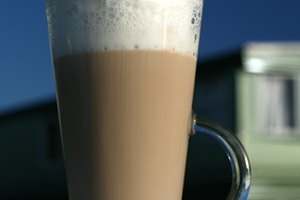 Heat milk to steaming. Some home espresso machines include a milk steaming compartment. If you have to heat the milk yourself, use a saucepan and bring the milk to the point where bubbles are just beginning to form around the edges of the pan. Whisk the milk until it is frothy. Pour 1 to 1.5 ounces of espresso into the cup, then add the steamed, whisked milk. Brew coffee by the drip method (pouring hot water through the grounds once), or using a French coffee press (which involves adding water to freshly ground coffee, waiting a few minutes, adding more water, and pressing down on the grounds with a plunger). Heat milk until bubbles just form around the edges of the surface. Pour the coffee into a mug or bowl and add as much hot milk as you like. Add sugar to complete the beverage. Drink it and/or dip breakfast pastries in it before eating. Use heavy cream or half-and-half instead of milk in American coffee for richer flavor. Use unrefined sugar for a slightly different flavor profile. 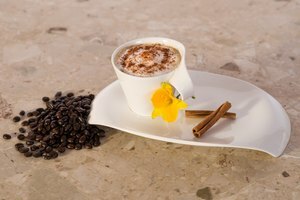 Flavored coffees come from whole beans flavored with fruit, nut, chocolate and other essences. 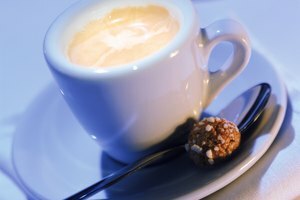 These coffees add depth and dimension to the drinking experience. Adding sugar and/or milk to them adds layers to the experience. Hot coffee can burn skin, lips and tongue. Be careful when pouring and drinking the brew.